Flying to Portland, Oregon, James Beard’s hometown where the 2010 IACP Conference was being held, I found myself rereading Epicurean Delight, the biography of Beard by my husband Evan Jones that was published five years after Jim died in 1985. So many lovely and telling reflections of his character surfaced that I wanted to jot them down but I didn’t have a notebook handy on the plane so I wrote them on what we publishers call the end papers of the book. 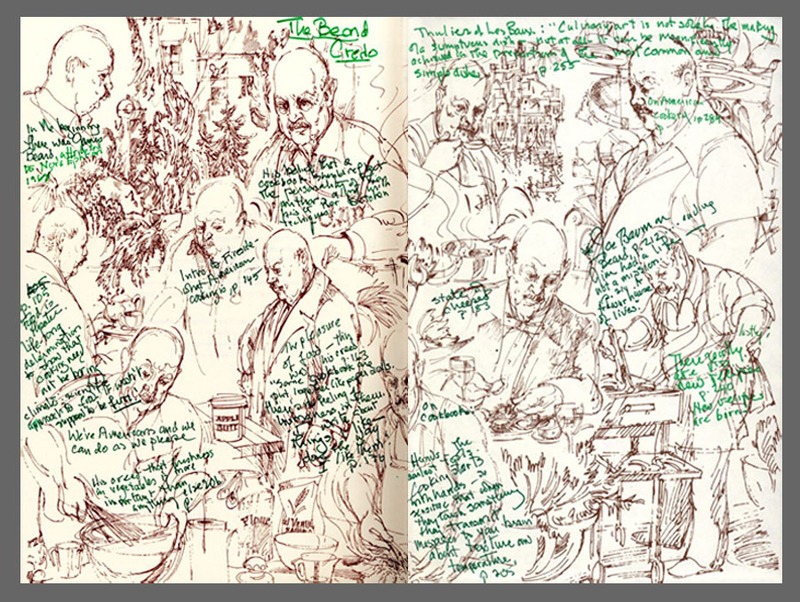 In Epicurean Delight the endpapers are illustrated with a montage of immediately recognizable action drawings that the artist Karl Stuecklen sketched of Jim at play in his kitchen—whisking the eggs, sniffing the soup, tending the grill, and just contemplating his domain. As I filled in all the blank spaces I could find, writing across Jim’s forehead or the apron covering his ample chest and tummy, suddenly the words seemed to be popping out of Jim himself and the whole mosaic of bons mots came vividly to life. “In the beginning there was James Beard . . .” wrote Nora Ephron. I realized as I read these excerpts how much I had absorbed from Jim Beard over the years. I always loved working with him because he helped me develop a more relaxed and creative approach to cooking and I could tell that he was much more comfortable working at the stove that having to tap out words on a typewriter. He welcomed any distraction. If the phone rang and it was Mrs. X from Iowa City he would happily take the call and go through all the steps of the recipe she was having trouble with to figure out why her cake hadn’t risen. Around noon he’d begin to get restless for lunch so we would descend the stairs to the kitchen where he would swing open the door of his large fridge and sniff around for leftover bits that he had tucked away, composing in his taste imagination a harmony of flavors. Half an hour later we would sit down to a simple and always delicious lunch, often interrupted by the sudden appearance of Larry Forgione, the chef proprietor of An American Place, or perhaps Carl Sontheimer, the father of the Cuisinart food processor, seeking advice or enlightenment. You didn’t need Google in those days if you knew James Beard. I came to know him when one day in 1961 I cheekily picked up the phone myself to ask him if he would look at the advance proofs of a big book on French cooking that we at Knopf were about to publish. He didn’t hesitate to say yes and after devouring it in just a few days, he called me to tell me how impressed he was with the book, Mastering the Art of French Cooking, and that we must be sure to bring these unknown authors over from France to introduce them to the American public. Then he took charge and persuaded Dionne Lucas to put on a French dinner party at her restaurant, The Egg Basket, and he personally invited the key players of the food world to attend and meet the authors of Mastering. That was Jim Beard—utterly sure in his judgment when he spotted the genuine article, unhesitatingly generous in his support, creative but at the same time realistic, and above all blessed with perfect pitch when it came to his palate. In a sense he was born before his time and he encountered considerable obstacles as he tried to awaken the American palate to appreciate really good home cooking and to make the most of our extraordinary regional produce. His cooking began in the marketplace in Portland where he would roam with his mother among the farm stands, selecting only the best to be transformed into delectable dishes that she served in her boarding house, or to visit the Chinese quarter with Let, their Chinese cook, so they could bring home the cod cheeks that the fish monger always saved for them. The first morning of the IACP Conference we took a Being James Beard Tour in downtown Portland and although urban growth has swallowed up the outdoor market where Jim and his mother shopped, the memories still remained. Robert Reynolds, who has sometimes been called the poet chef of Portland, read passages that he had selected from Epicurean Delight at each stop and I could see that he was deeply moved connecting with this man he had never really known before. The last night of the Conference I had the good fortune to eat at Robert’s very special restaurant, Chefs Studio. The place consists of one room large enough to accommodate a dozen or so at a big table. Votive candles were lit and strewn across the white paper-covered dining table, set for fourteen with big glasses awaiting good Oregon Pinot Noir. On three sides the rough walls consisted of exposed beams and a few posters while the remaining wall was open to the kitchen. There we could watch Robert and his crew of four performing their ballet, adjusting flavors before carefully plating each dish. From start to finish the food was superb, exactly what Himself would have loved. All the dishes were based on the season’s bounty: freshly gathered morels, tangy ramps and radishes and radish leaves, young spinach greens molded into little vegetable timbales, tiny berries and slim stalks of early spring rhubarb. The only item that had traveled from afar was the grass-fed lamb from the Southwest. As we were relishing its good, pure-lamb flavor, we talked to the rancher who had nurtured the herd—a young woman who clearly loved her calling—and we all exchanged sample bits of our life in food, ending with more stories about Jim. To me that evening at Chefs Studio was the highpoint of the IACP Conference and I wished that there could be more of this kind of sit-down dinner where people could get to know each other and experience the regional products. Meanwhile I look forward to a visit again in a few years when the dream of the James Beard Public Market that is being planned will have become a reality and I can wander through the stalls and visit with the vendors and learn more. I hope I’ll find some cod cheeks to bring home. Hi, Judith, I had the distinct pleasure of attending this incredible meal as well! (I was the one that asked about the input you had to the Julie & Julia screenplay.) It was wonderful to meet you and thanks very much for hosting. James Beard was full of quotables, wasn’t he? One that I very much like, and which I now have embroidered onto a doily made from an old dish towel, reads: “A gourmet who thinks of calories is like a tart who looks at her watch.” Not at all sure of the original context for this quote, but perhaps you know? Again, many thanks for hosting the meal and for this wonderful remembrance of Beard and Robert’s fare! I love the idea of the quotes written on the end papers. I wish I could read everything you wrote. I have been a James Beard fan for many years. Every time I go to Portland, I learn more about him. Next time I go, I, too, will reread Epicurean Delight, eat at Chef’s Studio, and hopefully visit the market. I really enjoy your postings and am pleased with your newest book since I cook for one after work each day. Thanks for writing it. The little souffle is terrific. I had the delight of spending a week in Jim’s classes at the Stanford Court a lot of years ago and it was an unforgettable experience. You’re right about the telephone calls – he always answered my questions with patience and added some good conversation before we rang off. Ms. Jones, your contribution to the food world is exemplary and you’ve provided so much “fodder” that is valuable and, also,lots of fun to use and enjoy. Thanks for being who you are and loving what you do. Judith – I’ve found your blog and all sorts of information about you via the Slow Food Martha’s Vineyard fan page – and how glad I am! I’m becoming inspired enough by reading that it’s quite tough to put words to it – the ones coming to mind are quite cheesy! Thank you for sharing – I’m going to look into your books – although I’m not sure where to start so perhaps your memoir would be a good place? Looking forward to having you here in July. Hi, Judith and Julia, I wish I’d been there. It sounds like it was a dinner for the gastronomic ages. I’ve been reading my father’s biography of Beard for a cooking class I teach, trying to find the reference to a baked salmon I know is hidden somewhere among the wonderful bon mots. I know I’ll find it but, in the meantime, am delighted to be rediscovering the great James Beard and the beauty of the book. This was the blog that made living vicariously a pleasure. Thank you, Judith! Judith and Julia, I wish I’d been there. Sounds like a memorable evening with Jim definitely “in attendance”. I’ve, coincidentally, been re-reading my father’s book trying to find a mention of baked salmon and enjoying the bon mots so much that it occurs to me it might be time to think about re-issuing “Epicurean Delight”. Thank you, Judith, for a lovely evocation of James Beard! I would love it if you could present your book at the fundraiser for our parish food pantry. The Church of the Ascension, 12 West 11th Street, Manhattan. Our fundraiser is on Thursday, June 10th and is a moveable feast. I believe that you would be a draw for people to come to the parish hall for dessert, see you and your book, and donate to a great cause, our food pantry. If you are able to either send me an e-mail that I provided above, or call me at 917-359-0592 I would greatly appreciate it. Judith, Off the subject, but I am working on an article regarding Evan Jones’ preacher grandfather, Richard. Please contact me if you have any information or memorabilia regarding him or his wife Marion Russell Jones. Thanks. My favorite James Beard quote is “I trust that everyone cut the article from “?? ?” magazine about how to skin an eel and kept it for their files”. Buy:Prednisolone.Accutane.Nexium.Actos.Retin-A.Prevacid.Synthroid.Lumigan.Zyban.Mega Hoodia.Petcam (Metacam) Oral Suspension.100% Pure Okinawan Coral Calcium.Valtrex.Human Growth Hormone.Zovirax.Arimidex…. Buy:Accutane.Nexium.100% Pure Okinawan Coral Calcium.Zovirax.Synthroid.Actos.Prednisolone.Zyban.Prevacid.Lumigan.Petcam (Metacam) Oral Suspension.Mega Hoodia.Valtrex.Retin-A.Human Growth Hormone.Arimidex….